A power tower is among the most useful home fitness equipment considering that we can work the entire body with the help of it. We can perform a wide variety of bodyweight exercises that are great for strengthening and building muscles. It can be the most beneficial pieces of equipment of your home gym. Below you can find the reviews and comparison of the best power towers based on customer reviews, price and the features they come with. For a quick review check out the table below, underneath you can find the detailed reviews about the particular product. Extras: handgrips, sling straps, workout placard. Weight assist attachment to help beginners performing the exercises correctly. At the back you can set a heavy bag (max. 100 lbs), so you can do cardio boxing workouts as well. Have no time? Take this questionary to find the most suitable tower for you! How it can help you to get fit? Weider has it its name in the field gym machines. 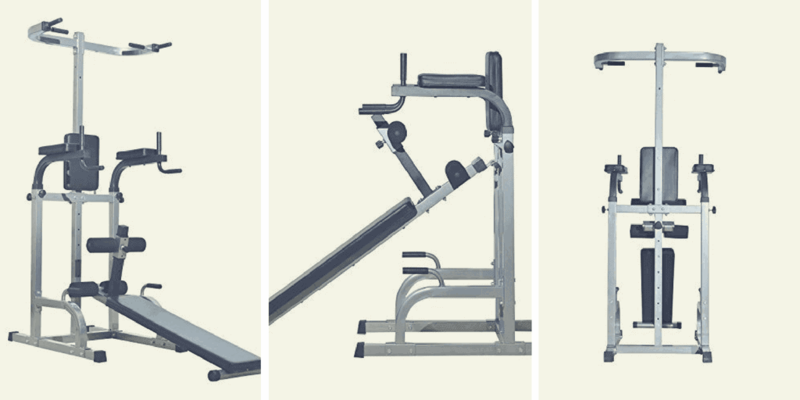 They made high-quality products, and that goes for this power tower fitness equipment. Even if it is an affordable model, people like it for stability and robust design. It comes with the typical workout stations and the thickly padded back, and hand grips make it comfortable to use. However, the assembly is not an easy task. Many customers complain about that the instructions are not clear and with that, after the assembly, it wobbles. On the other hand, some techie guys have shared great tips how to put it together to avoid bad construction. Also, a few buyers found the packaging of it pretty bad and complain about missing parts, but they get them after getting in touch with the support fast. Very well-built and solid structure. 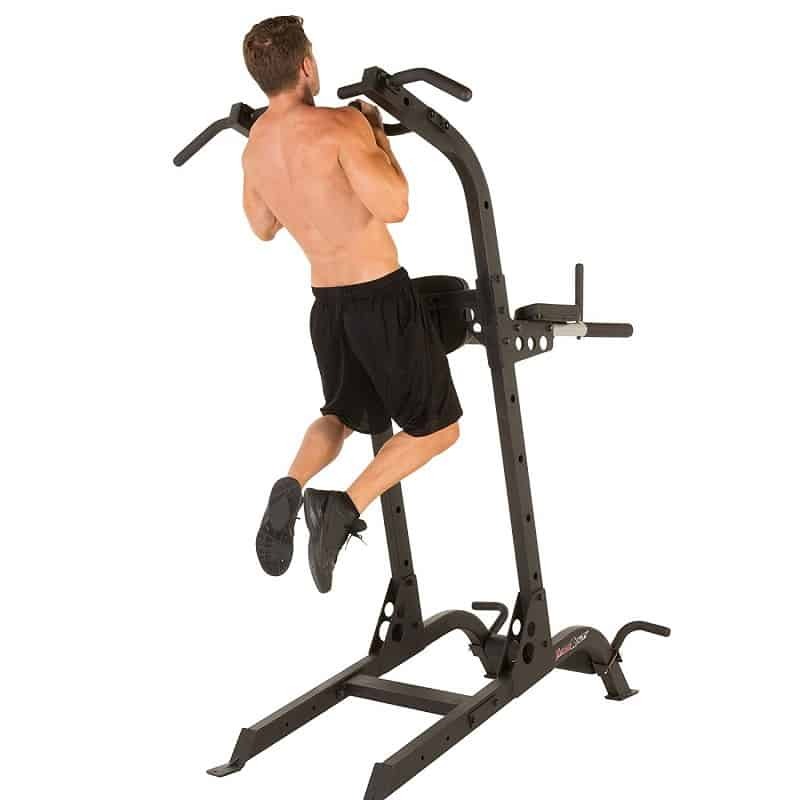 Great price for a well-made pull up and ab station. 57L x 41W x 84H inches (94 pounds). Can be used up to 300 lb. Some customers found it a bit too big for a small flat. A few complain about missing parts and packaging. Overall, for the price, you get a rather high-quality product that will undoubtedly serve an average user's needs. It works well for anyone under 300 lbs. It allows you to perform a very wide variety of workouts, all on the same equipment. Do your single knee squats, incline pushups, vertical knee raises, hammer pull ups, pushups, sit-ups, assisted dips, and progressive pull ups. It, therefore, gives you a full body workout, helping you burn extra calories, lose the weight, and increase muscle mass. This home pull up station handles a maximum weight capacity of 400 pounds, higher than most equipment can. This makes it a great pull up dip tower for a wide range of people. It is a commercial grade pull up dip station. A weight capacity of 400 pounds. Made of heavy duty powder coated steel tube frame. 2.25 inch thick angled forearm and elbow support. Made with two adjustable bars with foam rollers for multiple exercises. Seven mounting positions for adjustable handlebars. The tower has large two-inch thick foam dipped hand grips for maximum comfort and a firm grip while working out. Leg raise handles with two adjustable positions. Step support on its mainframe for easy step up when performing dips and leg raises. Multiple grip capability which will help you strengthen and sculpt your chest, back, triceps, Lats, and biceps through different hand positions. The legs can be bolted to the floor for maximum stability. 3 position adjustable stability beam for extra safety and stability. Perform over twenty exercises which include pull-ups, pushups, abdominal workouts, and triceps workout. This pull up dip station has received a lot of positive reviews from customers right from assembly to the workouts. It allows you to perform a very wide range of exercises, giving you real value for your money. It is quite a costly piece of equipment. However, it is well worth the investment as it is capable of giving you a full body workout, better than most of the gear in the gym. 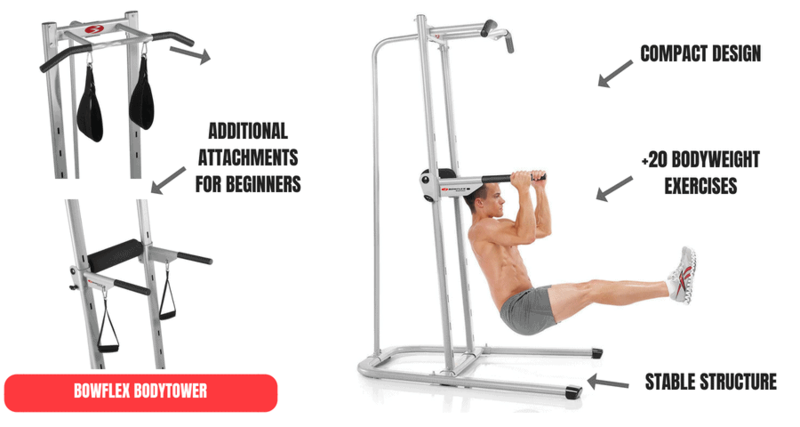 There will be no need for a gym subscription after acquiring pull up/dip/leg raise machine, and it will mean a big deal of savings for you in the long run. I would recommend it to anyone who is looking for a home gym equipment that gives a full body workout. This is commercial power tower that will give you value for your money. In case you are searching for a more robust model that can handle more weight then Xmark XM-4434 is a better option for you. Because of the 14-gauge steel frame construction, it can handle about 350 lbs. Hence, if you are heavier than an average, you can use it safely. Or, in case you are a pro, you can add extra resistance to your workouts by using weight plates with a belt or a weight vest. A problem that sometimes occurs with towers is that the dip handles are too wide or narrow. Most of the people who use XM-4434 found this feature pretty comfortable to exercise with. It is optimal for the bulk of them. However, the length of the dip handles can be a bit lengthier. Also, customer reviews tell us that the back and armrests are well placed and thick providing comfortable training. Keep in mind that this is a rather tall model. The height is 82.2 inches (211 cm) so it is maybe not the best option for a basement to use comfortably. On the other hand, this is the reason why it is suitable for taller people. The handles are covered with comfortable rubber for safe usage. It comes with narrow and wide pull up bar. No movement even if it is used on carpeted floor. The dip bars are not too wide. Sturdy structure made from high quality materials. Some higher and heavier buyers found it wobbling a bit. Lifetime home warranty. Excellent quality. Are you on a budget or searching for a tower that does not need so much space. If that is the case, Stamina 1690 is the product for you. Compared to other models here it is not as robust and featured-rich. For example, the capacity is just 250 lbs, and it does not come with a professional dip section. But for the price, you will get an item that is perfect for doing the most beneficial body weight exercises. Many customers us it in small flats. The manufacturer tried to put as many functions as possible into this compact power tower, and the most of them work pretty well. The only feature I would not suggest to use is the sit-up section. Stamina 1690 is too light for that, and it may fall on you. But you can put some weight on the base of it to avoid that. Customers like it for its lightweight structure and compact size. Hence, they can quickly move it around and store after working out. To conclude, for the price you will get a quite well-designed tower, that is not as robust and stable as the others but does its job pretty well. It takes small place, optimal for smaller rooms. Taller and heavier users complain about wobbling. A few complain about that there is not enough room for pull ups. This pullup and dip station that gets a lot of positive reviews. This is mainly because it is rather inexpensive, but provides great possibilities to have efficient body weight workouts at home. 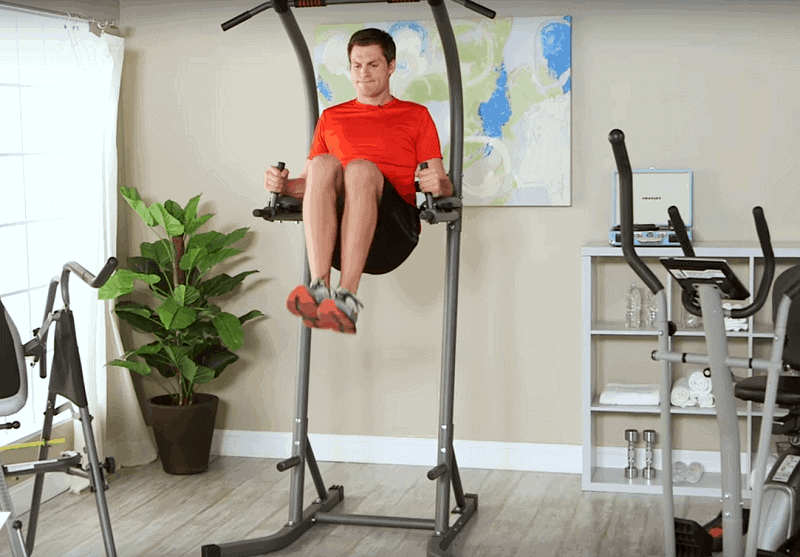 This exercise equipment is at a higher price range because it comes with several extra features for stability, better training, and more exercises. Firstly, this is an adjustable height power tower. It comes with EZ-Adjust horizontal bars that means you can lower or put higher the dip bars. This way you can do more types of exercises such as decline pushups. Or, this function might be useful if you are a beginner and you cannot do full motion dips or leg/knee lifts. Another very useful extra for beginners that this Bowflex Tower comes with are the sling traps. Sling traps are useful to keep the correct form while you do leg lifts or knee raises protecting you from moving forward and backward. Hence, you can focus more on the exercise itself. Also, you can do supine rowing which is an excellent starter bodyweight back exercise. Most of the users found it stable. The reason is that it is made from commercially grade steel frame. However, it should be a bit taller, I think. The height is just 77 inches (195 cm), so for tall guys like me, it is not the best option. Adjustable horizontal bars which let us to more types of exercises. Since it comes with more functions we can use it for more kinds of workouts. Sling straps which are very useful accessories for beginners. Sturdy structure made from the highest quality of materials. Rubber covered handles for safe usage. Dipping bars are comfortable to use. Workout placard demonstrating many exercises. A few buyers find the pull up bar a bit low. A few had problems with shipping. In my opinion this the best power tower for beginners since it comes with useful extras, although it is a bit more pricey than the others. It allows you to take charge of your health and take your workouts to the next level because it is a complete home fitness gym. It allows you to perform multiple exercises, including waist, abdominal, and upper body, all in one gym stuff. It has several functions for the various body workouts. The Soozier Home Fitness Station w/Sit-up Bench handles a maximum weight capacity of 665 pounds, which is much higher than other products can accommodate. This makes it a great equipment for a wide range of athletes. Sit-up bars enabling you to tone and build your abdominal muscles. A vertical knee raise section that will help you reveal and define your abdominal muscles. A push-up handles with cushioned handgrips that provide comfort as you work out your abdomen, waist, chest, and upper limbs. A multi-grip pull-up bar that helps you improve the strength of your arms. A dip station with padded hand grips to help you work on your upper body, especially the chest, shoulders, and triceps. Well-padded cushioning for a more comfortable workout. The elbow pads are contoured, and it has oversized dip handles for extra comfort. The overall size is 69 x 35 x 80 inches (L x W x H) and weighs 112 pounds. The maximum weight capacity is 665 pounds. Adjustable sit up bench that allows you to increase or decrease the angle of the board for more or less resistance. It has received a lot of positive reviews from customers due to ease of assembly and the fact that one can do a whole body workout on the same equipment, including sit-ups. Customers believe that it is worth every penny that you spend buying it. It is very easy to assemble and disassemble; the assembling tips are diagrammatic, making them easy to follow. Allows a wide variety of workouts. It is very stable; does not shift or wobble at all. If it is placed on an uneven floor, it is bound to be a bit unstable. This can be solved by putting a piece of gym flooring made from rubber or foam. I can be also a bit higher. If you are looking for equipment that allows you to have a full body workout, then this is definitely the pull up bar station for you. I highly recommend Soozier to anyone gym due to time limitations or for any other reason. It is also perfect if you are looking to save on gym subscription. Well if you look for a tall power tower PT600 is might be the right choice for you. The height of this power tower home gym is 85 inches (215 cm), so it is perfect for taller users. But, because of this, you can only use it comfortably in a high ceiling area. But, the footprint is not big. The price is not bad, but you get what you pay for. Customers think the design should be much better. Also, they complain about missing parts, bad welding and bolting, and that the instructions are not clear. Hence, the dip bars jiggle, and it is not so stable. Well, in my opinion, it is better to invest into something better at a bit higher price. It is pretty annoying to work out with a wobbling tower. Adjustable push up bars for better chest workouts. Padded back and arm cushions. Some complain about the dip bars are too wide. There were a few shipping problems. Not bad for the price but there are some problems with it for sure. Considering the price and the features this tower is not a bad deal at all. It has the traditional functions and construction is OK as well. The manufacturer made a D-frame base that provides better stability compared to other models. But that part can be used for doing push up or easy dips as well. Well, for the price it is absolutely worth it, and it could be a useful workout equipment of your home gym. D-Frame base for enhanced stability. Users like it since it does not wobble at all no matter what sorts of exercises they do. Thick cushion for comfortable use. Although, this item has not got so many reviews yet, but it should be mentioned here since it is maybe the most stable one. This machine has been built for beginners to help perform their first pull ups and dips. It has a unique lift assist technology that elevates the user to carry out the moves in case they have not enough strength yet. The amount of support can be adjusted with the 4 included bands. However, additional bands cannot be bought. The weight capacity is amazing, it can handle up to 600 pounds. Hence, it is a good solution for those overweight people who want to start working out. Customers like it for its ergonomic design. The handles are comfortable to use and provides various grip positions. Also, it comes with an adjustable sit up bench for training your abs. Split grip pull up and dip bars. Vertical knee raise (VKR) station. 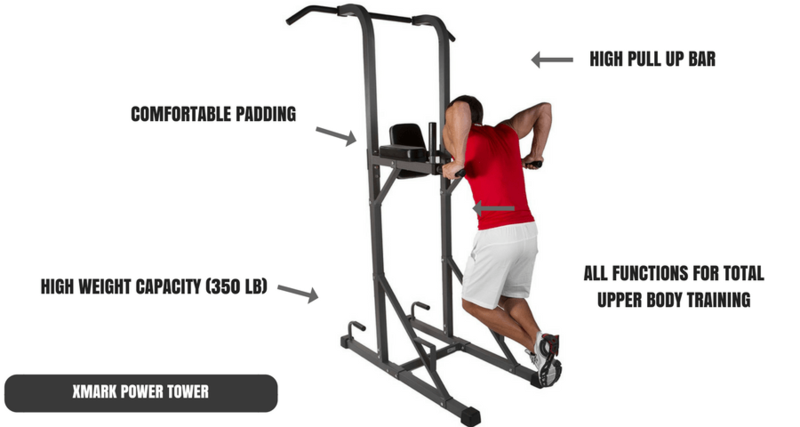 The weight assist attachment includes 4 weight assist bands to assist in dips and pull ups. A bit hard to assemble. Are new to bodyweight training? Can't you perform pull ups and chin ups correctly yet? Then, this model is for you since it comes with lift assist. Perfect for beginners and girls. Heavy bag training is one of the most beneficial workouts to develop your cardio, endurance, burn fat and even to release stress. And bodyweight training is great for boosting your strength and building muscle mass. Now, with this professional exercise tower, you can do both. XMark Deluxe has a section at the back that allows you to hang a maximum 100 lbs bag. That is enough for anyone to have a great punching workout at home. It has a distinctive design that does not let the tower to fall over. But I think the best is if we fix the base to the floor or use the Olympic weight adapters. Keep in mind that it does not come with a punching bag, though. Besides the traditional workout stations and the heavy bag stand, it comes with other useful features. For example, you can store your weight plates, and it has sit-up bars. Because of the heavy duty construction is rather heavy, so it is hard to move around. But if it were light, it would not be stable enough for a bag. Putting it together is not easy, and you will surely need help if you are a not a techie guy like me. Don't forget you will not be able to train as if you use a hanging heavy bag. You can punch the bag from the left, right and the front, but you cannot go around. And you should be careful with the basement of the tower. In spite of this, you can have a great heavy bag workout at home without needing a lot of space. The price is higher compared to other power towers, but you get pull up dip bar equipment that is suitable for cardio workouts as well and provides more types of exercises. 100 lb. punching bag capacity. Great for for boxing, martial arts, and cardio workout. If you want a home fitness equipment that lets you to do both strength and cardio training this model is the best solution for you. You can do the same bodyweight exercises with it, but you can hang a heavy punching bag at the back of it. Boxing is a proven way to burn fat and develop endurance. With the pullup and dip machine, you can do a wide and narrow chin-ups and pull ups for working the back, biceps and forearm muscles. You can also do knee or leg raise or their variations to work your core. You can train those pulling muscles of the upper body. The push up station is great for doing various push up exercises to work the chest muscles, but also train your triceps and shoulders. 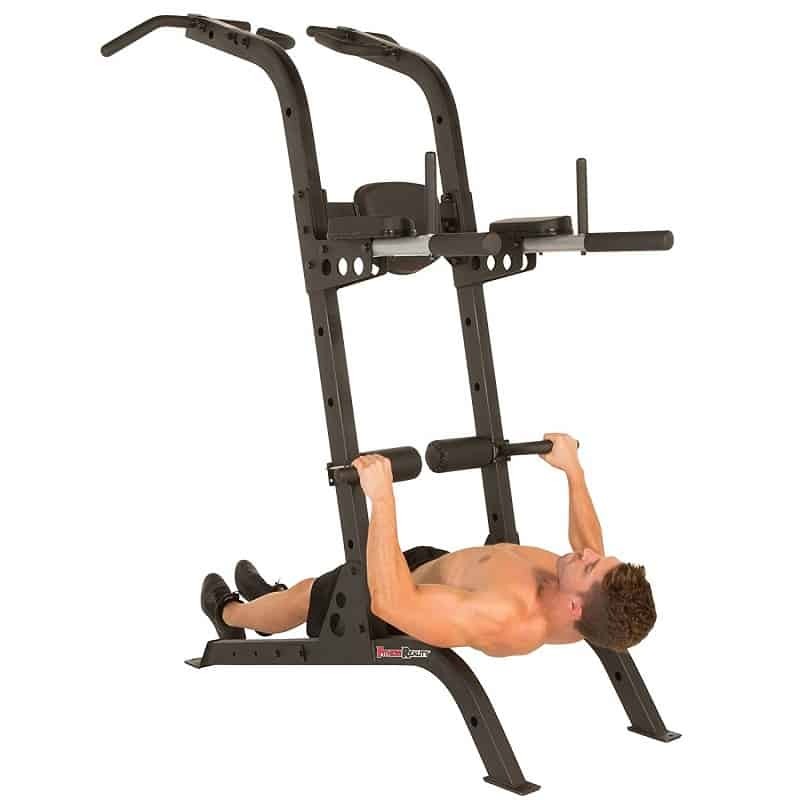 The dip station is suitable for doing dips that are efficient moves for triceps, shoulder and even your chest. It can also be used for doing ab workouts such as vertical knee raise. A workout station is an extremely versatile exercise equipment to do bodyweight workouts at home. Did you know that bodyweight exercise﻿﻿s burn more calories than the ones with weights? The reason is that they are compound moves, so many muscles work at the same time, and that needs more energy. On top of that, these exercises are safer as they are natural moves for the joints and muscles. You can find sample power tower workouts here. Although, a workout tower provides so many ways to exercise, it does not need so much space. Hence, it is an excellent solution for those who has not so much place at home. An affordable strength training equipment. The basic models cost around $100 – 150. If you wanted to buy weight plates, dumbbells, a barbell, a bench, etc., you would have to pay far more. 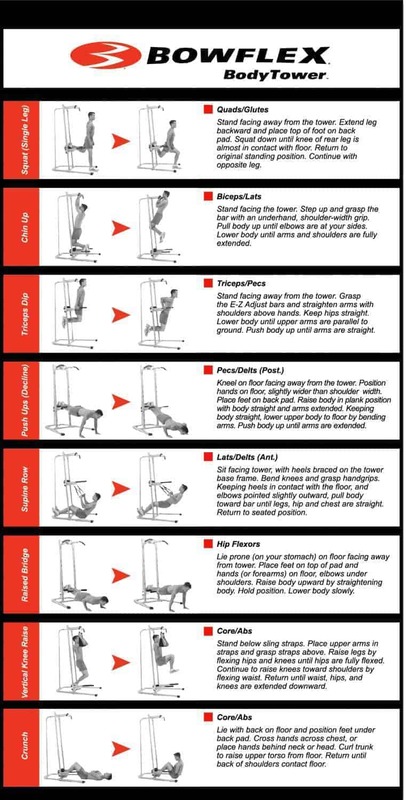 A few example fitness gear power tower exercises. One disadvantage is that you cannot do leg workouts with it. Although, you can do prisoner or single leg squats or buy a pair of dumbbells that allow to do various exercises for legs. Lighter models wobble a bit. Before purchasing a fitness gear pull up tower, check out its specifications to see if you are going to have have enough space to use it comfortably. Cheaper models are lighter and not so well-constructed, so they may wobble and have weight limitations. You can buy the dip and pull up station separately. However, they will cost more, and you are going to need more space to store them. Pull up dip bar types. How to Get Rid of Wobbling? In case you place your power tower fitness station onto floor that is not smooth or flat, you should use gym mats. They are useful for many reasons. They help to protect the floor and keep the power tower at its place while use it. But, in most of the cases wobbling comes from bad assembly. So, pay attention to the instructions. It depends on how much money you would like to spend on your pull up stand. 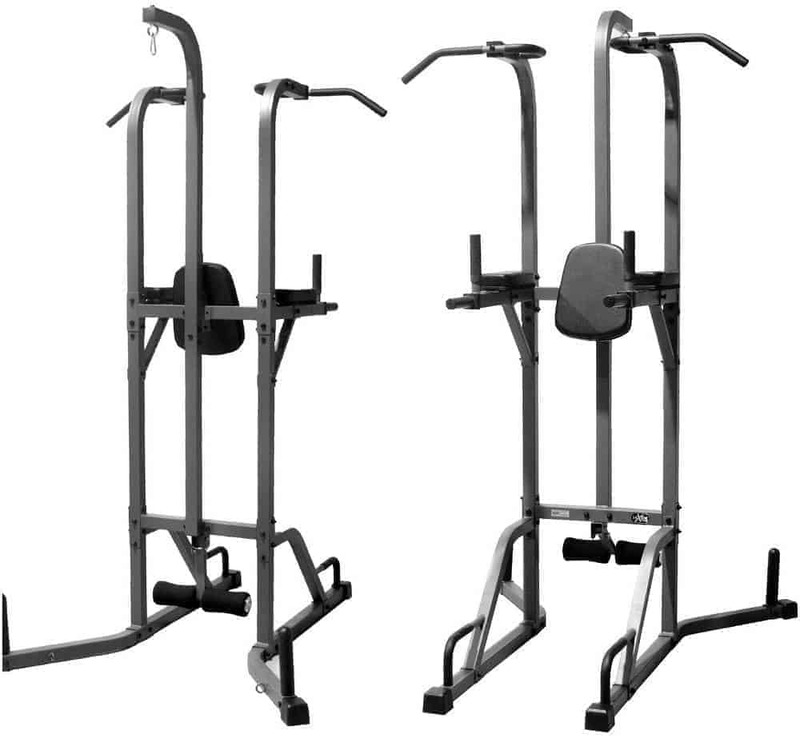 Each of the power tower pull up station above is high quality ones made by trusted manufacturers. Anyway, the best buy is definitely Fitness Reality X Class High Capacity Multi Function Power Tower since it comes with the most features, but if the price is important Body Champ is the best option. Can I use a workout station for muscle ups? Well, I do not suggest you using a traditional tower for that purpose, at least it is fixed to the floor. Have you got any question? Need help? Feel free to comment below! We will help you! 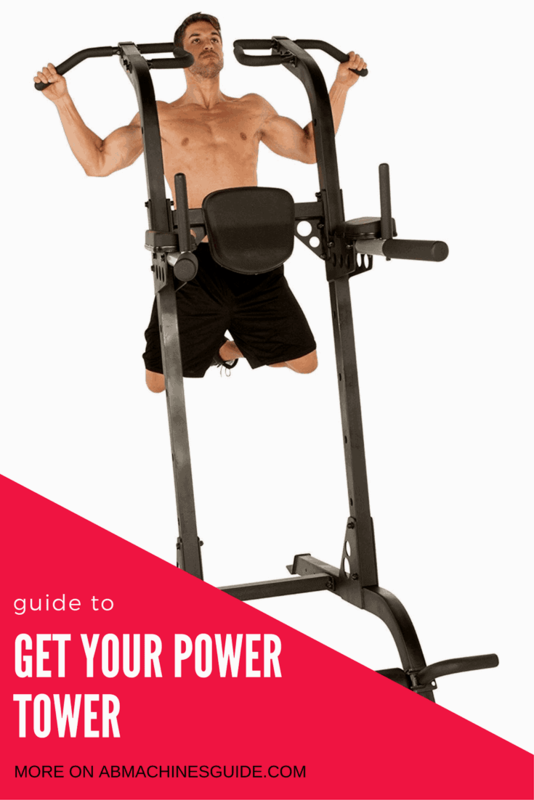 Did you find the best power tower gym for you? Share with your friends! I’ve used one of these at the gym and want to purchase one. But how sturdy are they? I don’t want it to fall over or scrape my floor up because I’m not mechanically inclined. I worry that I will inure myself if I build it. For an average man, these power towers are OK. To protect the floor, put a gym mat under it, that is also a good to avoid wobbling. What is the difference between a home gym and pull up dip station equipment? Which is better for a beginner girl? 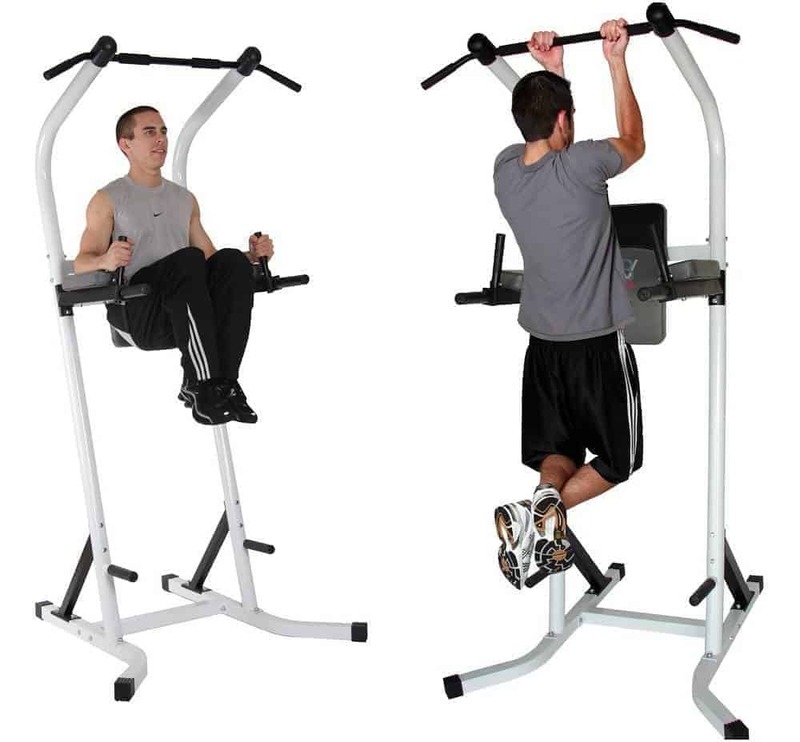 The workout station is suitable for doing bodyweight exercises such as pull ups, dips, and vertical knee raise. While a home gym, depending on the machine, provides various functions to train different body parts using weights. With a machine, you can use less or more weights, while with bodyweight exercise equipment you have to use your entire weight as resistance. So, if you are beginner maybe a machine is better to start with since you can use less weight. Are these suitable for doing exercises with extra weights? I mean, doing bodyweight exercises such as dips with extra 50 pounds or more. Check out the weight capacity. On this list Fitness Reality has the highest about 400 lb. I think that is enough for most of us. 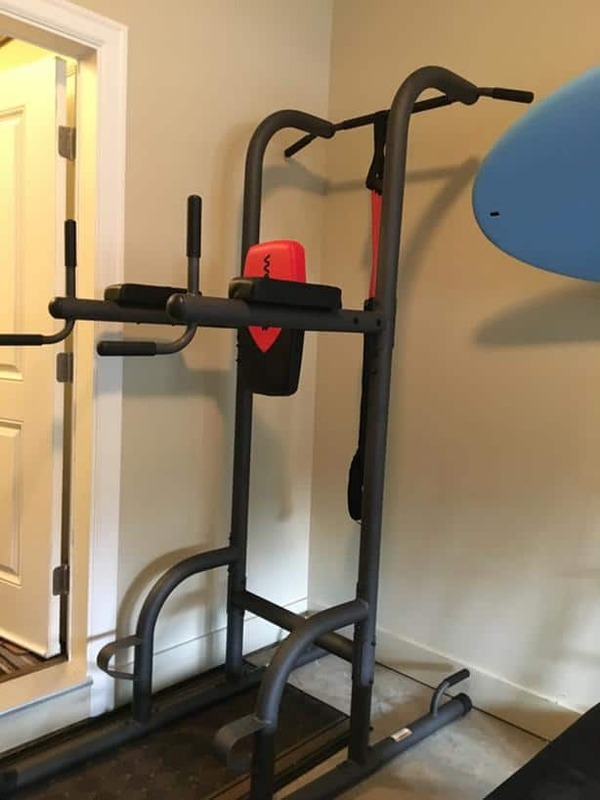 I have a home gym for long years with weight sets, power rack, etc., but I have just bought a power rack (Fitness Reality). I love it is perfect for doing bodyweight exercises such as pull ups and dips. It doesn’t take so much space but very versatile. I recommend for everyone who wants to work out at home.